DailyDirt: Can Education Ever Be One-Size-Fits-All? The latest chapter in the bizarre story of Paul Ceglia claiming a right to more than half of Facebook is that Facebook -- who has previously claimed that Ceglia is nothing but a fraud -- says that in the discovery process it found the original contract, and that contract doesn't even mention Facebook. Facebook pretty clearly is suggesting that Ceglia doctored the contract he did have with Mark Zuckerberg, to work on a Ceglia project called StreetFax, and changed it to supposedly cover Facebook. 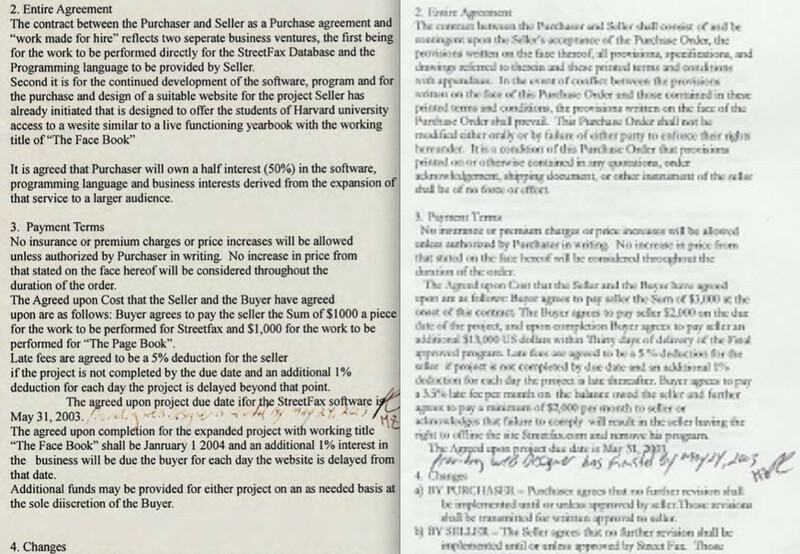 If you look at the two documents side by side you can see clearly that the original was changed. The fact that both have handwriting and both MZ and PC's initials on it show that this is the same document: Given this evidence, and how this case has gone so far, especially with multiple lawyers dumping Ceglia (including some big names who surprised a lot of people in taking his case originally), it doesn't look like Ceglia has much of a chance here. I'm still a bit mystified that Zuckerberg and Facebook didn't come out more vehemently originally. When the story first came out, Facebook's lawyers simply said they were unsure if the contract was legit. You would think that if he'd never signed any such thing, the denials would have been a lot more upfront. Still, in the end, this case looks dead in the water. You will see that there's a misspelling of 'seperate' in the sentence "separate business interests', for one. No good lawyer in his right mind (if Ceglia even used one) would dare to misspell such a common word. "University" is not capitalized, as is usual form for the usage...and I could go on to mention that one version is more detailed on specifics than the other, but I won't. Clearly someone was hoping to make big bucks from FB, but it won't be Ceglia. Case closed. Fraud at the least.